Robert, one of our directors, has had an article published in this months edition of Geographical magazine focusing on the increasing role private conservation initiatives are playing in the battle to protect and save Africa’s wildlife. Its been published to help raise awareness of these schemes, many of which depend on the revenues generated by tourism to fund them and allow the lands in question to become a safe habitat for the wildlife. 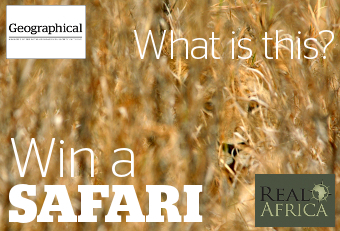 Real Africa and Geographical, the official publication of the Royal Geographical Society, are running a competition with the prize being a visit to one such conservation area in the Masai Mara. To enter, look at our competition page. The age-old conservation dilemma. How do you balance the needs of the wildlife with the needs of man? As the human population grows so does its requirement for food. This means more land is taken for cultivation and grazing, which in turn reduces the natural habitats of the wildlife. They find their territories reduced and the staple plants in their diet destroyed and leads to conflict as crops are damaged and livestock eaten. It is for this reason that the National Parks and Reserves in Africa are seen as vital for the survival of many species of animal. The remorseless destruction of their habitats has made them a last bastion, the final place they can live their natural lives unmolested. Now a scheme in Kenya is showing that wildlife can make a comeback so long as the relationship between it and the human inhabitants is carefully managed to the benefit of both. The premise is simple. Convince the local population that the wildlife can generate them more income than traditional farming. Even better is to show them that they can live alongside the wildlife and benefit from the income it generates, without it affecting their traditional lifestyle. How is this done? A successful example is the Mara North Conservation area, 64,000 acres situated immediately to the north-east of the Masai Mara reserve. The villages and communities living in this area wanted to benefit from the tourism attracted by the wildlife in the reserve, without compromising their lifestyle. 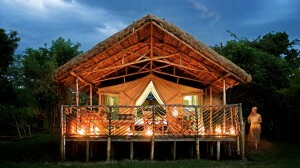 This was achieved by offering concessions to a limited number of low-impact safari camps. A committee was set up, each camp represented, who manage the lands as one. They work in partnership with a Masai Landowners Committee, acting in the interests of all landowners within the Conservation area. These landowners meet up at bi annual meetings. The key component is the grazing as this is the biggest source of potential conflict and it is managed in a simple but effective way. At any one time, one third of the land is for the Masai to live in, one third is for the domestic animals to graze and one third is left exclusively for the wildlife. Should a herdsman be found grazing in the wrong area, he is fined. There are no fences, the wildlife is free to roam freely throughout the entire conservation area, but there are always zones that are free of Masai herds that can be used by the camps to provide game-drives to their clients. These zones are managed so that during the peak tourist season they offer the best possible and most diverse viewing in areas that are the most convenient for the camps, reducing the driving times of the safari vehicles and therefore the disturbance to the wildlife. The camps have discovered another benefit of the grazing programme. During the rains – April to June and November – when the grass grows tall, the wildlife tend to congregate in the grazed areas as they can see much further and get more warning if a predators is on the prowl. Encouraging the game to live in proximity with the Masai and their herds does of course lead to conflict. The big cats will kill the domestic livestock if the opportunity arises, and to prevent this becoming an issue, a compensation scheme is run to ensure the owner of any slaughtered animals are not financially out of pocket. Mobile Boma, used to keep the herds same when away from villages. Advice is given on how to keep the livestock secure, especially at night when the herds of cattle, sheep and goats are fenced in boma, or small enclosures. Traditionally these were made of wood and thick thorn bushes. Now wire-mesh panels are provided to create boma that will keep hungry hyenas, leopard and lions at bay. Mobile enclosures are also provided for keeping stock secure when they are grazing areas too far from their homesteads to return to every night. In exchange for granting the camps the right to operate on their lands the Masai settlements receive a rent. Depending on the area and the management, this is either a percentage of the turnover of the camp, or a fixed rental payment. This money is administered by the management committee and a certain percentage of it used for communal projects that benefit the entire population. 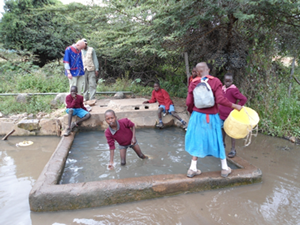 An example is the OBEL project, aimed primarily on the provision of education to the communities involved. This ranges from the building of new classrooms and facilities at the local schools, to providing IT training to older students. The budget for this project, funded by the conservation area, is US$ 1 million, spread over three years. Other camps provide medical clinics and a midwife unit, as well as water supplies. Money from the rental payments is also used to provide protection for the game. At a time when poaching, driven by the market for ivory in the Far East, is increasing, the conservation areas employ Armed rangers and guards to protect the wild animals by patrolling and liaising with the Masai herdsmen. 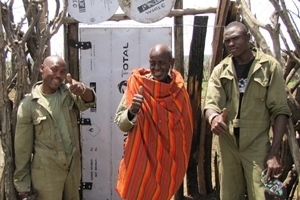 The Masai landowners who allow their land to be used within the scheme receive the remainder of the rent. This initially created the problem of them using the money to purchase more cattle, the traditional indicator of wealth within their community. This put more pressure on the grazing within the scheme. In the last year, however, they have started investing their money elsewhere, recognising this conflict and not wanting to risk the success of the tourism. Cattle is the traditional way for Masai to show wealth, leading to conflict with wildlife. The camps also provide an important source of employment to the members of the local communities who do not own land. This allows them to earn a cash wage to bring back into their communities and spend in the local shops. There are opportunities to train in specific hospitality sector skills, such as the Cookery and Forestry schools run by the Karen Blixen Camp. 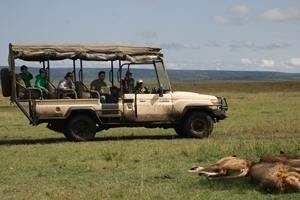 The Mara North Conservancy is one of three managed by Seiya Ltd, a private company based in Nairobi. If you combine the areas of these, plus other conservation areas in the region, more land is now privately managed that in the whole official Mara Reserve. Their success is such that Seiya also manages the “Mara Triangle”, part of the main reserve itself as part of a not-for-profit organization under the control of the district council. Maintaining roads lets tourists in and gives the Masai access to new markets. One of Seiya’s managers is Justin Heath, who looks after the Naboisho Conservancy as well as advising on grazing in other areas. He is a good example of the new generation of conservationists who understand you have to work with the local communities, rather than trying to preserve the land just for the wildlife. If managed correctly, it will improve the lives of both the local people and of the whole ecosystem, allowing the wildlife to thrive in areas they would previously been hunted or driven away, while the communities are given access to the benefits of tourism they were previously excluded from. 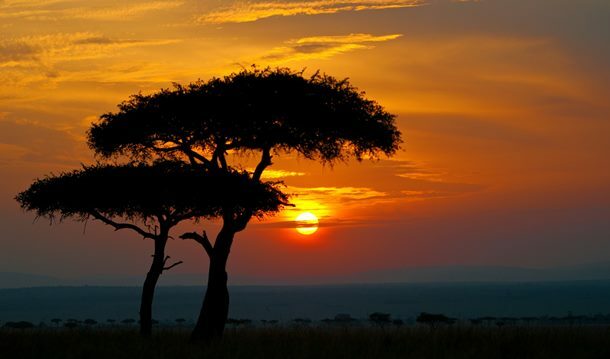 A ray of hope for the animals of Africa?